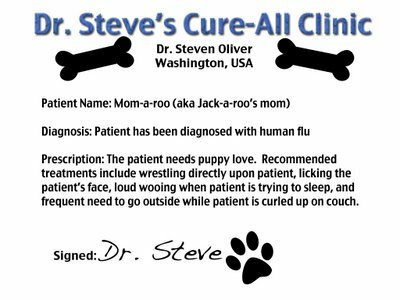 Well, Jack, I am willing to treat any patient, human or canine. Maybe even some felines. So I've been hearing on TV about the swine flu. Since Jack's mom isn't a swine, I decided she must have human flu. I hope Star and Jack are being very careful because human flu could cause a pandemic within the canine population. You just never know and if a news outlet picks up the story, it will be a pandemic for sure! Star and Jack, you might want to wear a mask around your mom, just in case. I have prescribed a highly aggressive treatment for Star and Jack's mom. It will take a lot of dedication on the part of Star and Jack, but I'm confident that with time, their mom will be back to 100% in no time. Nurse Kat has proved this treatment works, as she is quite skilled in this area. So, Jack, I sure hope this helps your mom. And all of the other pups who have written in for prescriptions, I'm working on cures for each one of you. Just be patient and keep an eye out on this blog!